How I Gained It: My weight began to climb with the start of a new job that had me traveling a lot. As a corporate event planner for a travel company, part of my job was to do taste-testings at various hotels, restaurants and other venues. Between the tastings, room service and airplane food, my weight quickly spiraled out of control. I was aware of how heavy I had let myself become but rationalized that I would be getting pregnant soon, so it would be pointless to try and lose the weight. I gained about 30 pounds with my first pregnancy and went on Weight Watchers shortly after my daughter was born. I lost about 40 pounds and was pretty happy with myself. However, I stopped attending meetings and quickly gained it all back. After the birth of my second daughter, I was at an all-time high with my weight. I knew I needed to get my act together and join Weight Watchers for my third, and hopefully final, time. I had done well on the plan twice before, but with shortsighted goals and lack of motivation, I wasn't able to hit my goal weight. Sadly, it took a tragedy to finally find the motivation to stick with the plan, and ultimately, hit my weight loss and fitness goals. Breaking Point: A friend of mine unexpectedly passed away from a burst brain aneurysm, leaving behind her 18-month-old daughter and husband. My heart broke for her little girl, whose only memories of her mother would be from pictures and videos. It forced me to think about what memories my daughters would have of me after I was gone. Unfortunately, there wouldn't be much for my girls to remember me by, as I would never let myself be photographed because I was so heavy. I decided right then and there that I would lose the weight and start living a healthy life. I would no longer shy away from the camera. I wanted them to be able to look back on all of our moments together and not only see a mother who loved them unconditionally, but who loved herself enough to get healthy. 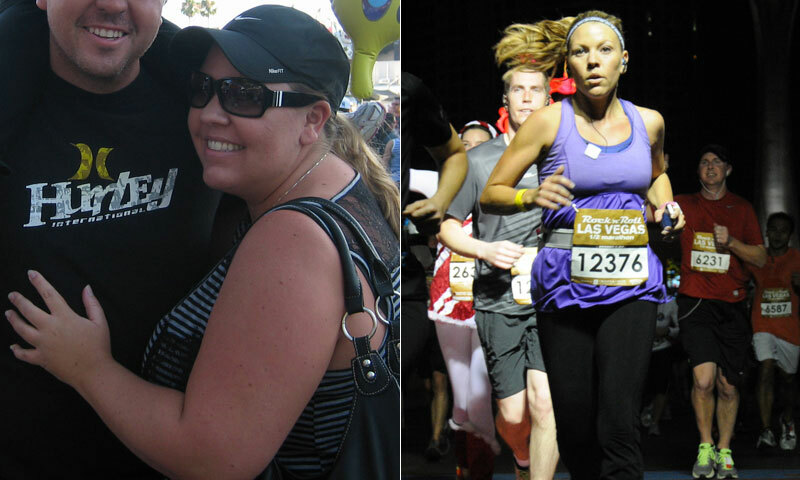 How I Lost It: I joined Weight Watchers in April 2012. This time around, in addition to tracking and attending weekly meetings, I made exercise a key component to my weight loss. I'm a busy stay-at-home mom and part-time event planner, but with my new motivation, I found ways to get my exercise in. While my girls took their naps, I started working out on the elliptical in my garage for an hour a day. As I started to lose weight, I increased my activity by taking an hour-long Piloxing class once a week while my husband watched the girls. In December, my elliptical broke and it was going to be several weeks until a replacement part arrived. I didn't let that stop my exercise routine. I started running at night after the girls went to sleep. I never knew how much I would enjoy running. Even after my elliptical was repaired, I continued running three to four times a week. In February, I ran my first half-marathon and the following day I signed up for my next one. Since my first half-marathon race in February, I have completed a 5K, a 5K mud run, a 10K and three more half-marathons. This journey has changed my life and the life of my family. I'm a runner now and currently training for my first full marathon in February. My oldest daughter has even started to run and has completed two kids’ races. I recently launched my own fitness blog, Run Weigh Mom, and enjoy inspiring and interacting with other people who are on a similar journey. I fit into the clothes I've always dreamed of wearing. My girls have a mother with more energy, and my husband has an extremely happy wife. We all eat healthy meals together, enjoy the outdoors and exercise more than ever. I'm finally the woman and mother that my family deserves!